"Lou 2: the Comeback Continues" -- Dorian Yates faces a determined group of challengers, including a re-inspired Lou Ferrigno. From Atlanta, Georgia. 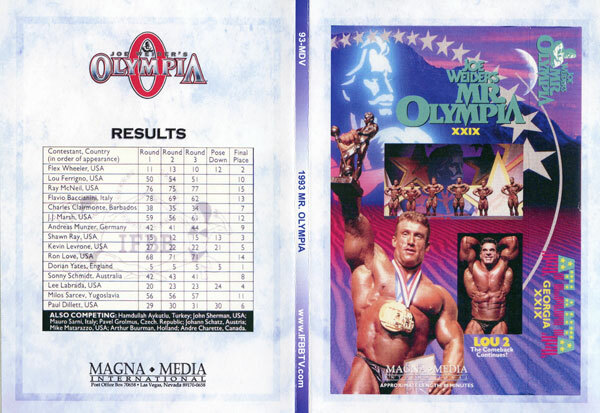 This DVD also includes Charles Clairmonte receiving his highest placing in the Mr. Olympia. Starring: Dorian Yates (1), Flex Wheeler (2), Shawn Ray (3), Lee Labrada (4), Kevin Levrone (5), Paul Dillett (6), Charles Clairmonte (7), Sonny Schmidt (8), Andreas Munzer (9), Lou Ferrigno (10), Milos Sarcev (11), J. J. Marsh (12), Flavio Baccianini (13), Ron Love (14), Ray McNeil (15). This is an authorized and licensed copy made directly from the broadcast-quality master tape.